Focus on the relationship between pump efficiency and the total dynamic head. In 2015, irrigation accounted for almost 42 percent of all freshwater withdrawals in the United States, according to the U.S. Geological Survey (USGS) (1). This amounted to about 118 billion gallons per day. In addition to agricultural use, irrigation of golf courses, parks, nurseries, turf farms, cemeteries and other self-supplied landscape-watering uses also are included in the estimate. Agricultural irrigation accounted for about 81 percent or 95.6 billion gallons per day of the total. Surface water sources supplied about 52 percent and groundwater sources supplied about 48 percent of the total for agriculture. Many irrigation systems are pressurized and therefore need a pump. Because the heart of most irrigation systems is the pump, it is important to select the correct type for the irrigation system and it must be as efficient as possible. Choosing an irrigation pump is based on the type of pump and also on the relationship between pump efficiency and the total dynamic head (TDH) at a specific flow rate. Surface water or well water will give you the source of water, and its availability will be determined by the local geology and hydrologic conditions. The type of irrigation system, distance from the water source and size of the piping system will determine the flow rate and total dynamic head. Use Tables 1 and 2 to help with the selection process for a broad range of flow rates and total dynamic heads. In Table 2, suction lift is not included. If the application needs to lift water to the pump, a centrifugal pump must be used. Table 2. 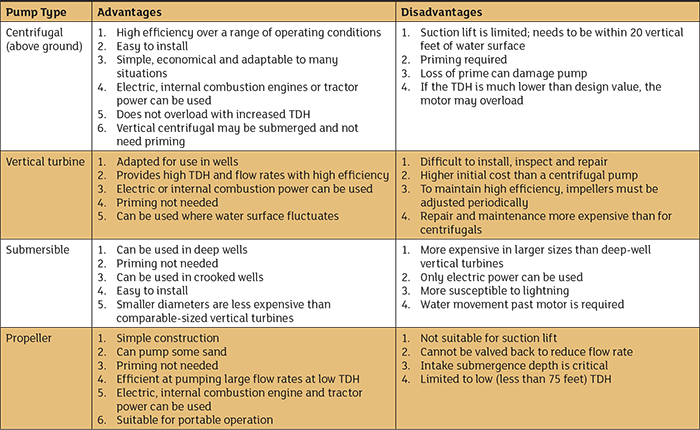 The most desirable pump types to use for a given range of flow rates and total dynamic head (TDH). Above-ground centrifugal pumps are commonly used with surface water sources or shallow groundwater sources. They are also used as booster pumps in irrigation pipelines. They must be filled with water, or “primed,” before they can operate. The suction line and pump must be filled with water and free of air, so airtight joints and connections are important on the suction pipe. Centrifugal pumps are designed for horizontal or vertical operation. Horizontal or vertical refers to the orientation of the motor and drive shaft, not the impeller. Horizontal centrifugal pumps are the most common for irrigation. They generally offer lower cost, require less maintenance and are easier to install and inspect for maintenance than other types. While self-priming horizontal centrifugal pumps are available, they are usually special-purpose pumps and not used in agricultural irrigation. Vertical centrifugal pumps can be mounted so the intake and impeller are always under water. Priming is unnecessary in this case, making it useful for floating applications. A self-priming feature is helpful in areas with frequent power outages or with center pivots where automatic restart is a programmable function. However, more maintenance may be needed because the bearings are constantly under water. Used in cased wells or where the water surface is below the usual limits of a centrifugal pump, deep-well turbine pumps do not have to be primed because their intake is always under water. These pumps are generally more expensive and more difficult to inspect and repair than centrifugal pumps, but they are usually more efficient. The turbine pump includes three main parts: the pump head assembly that supports the motor, usually cast iron and installed on a foundation; the shaft and column assembly; and the pump bowl assembly. The line shaft on a turbine pump may be water- or oil-lubricated, but if it is used for a domestic water supply or livestock, a water-lubricated pump must be used. Some states, such as Minnesota, require use of only water-lubricated pumps in new irrigation wells. The pump head assembly provides alignment between the pump and the power unit.